My First Online Payday Review - It's a Scam! 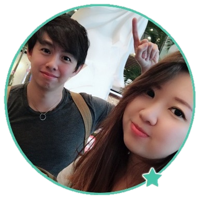 My First Online Payday found at myfirstonlinepayday.io is promising to help you make a lot of money from home, but you can’t trust them. Don’t buy into their software, because My First Online Payday is a scam. Read our in-depth My First Online Payday review to find out the truth they’ve been hiding. 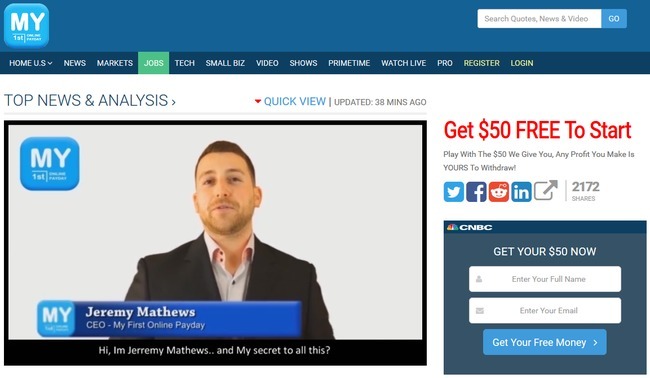 The alleged owner of My First Online Payday scam, Jeremy Mathews introduces the software as revolutionary as it helps people make money from home. It works even for people who have not done a single trade in their life before. There are video testimonials of users thanking Jeremy for giving them this opportunity to make big money online. But the important question remains – are these testimonials real? Can you really trust Jeremy and his software? We are here provide all the hard truths and quite frankly, disappoint you if you think you have finally found a goldmine. But we won’t just bust the scam. We’ll guide you to the proper way to make money online, so make sure you read till the end. Compare this man to the alleged CEO of My First Online Payday scam. The CEO of the scam is just a fabricated identity. 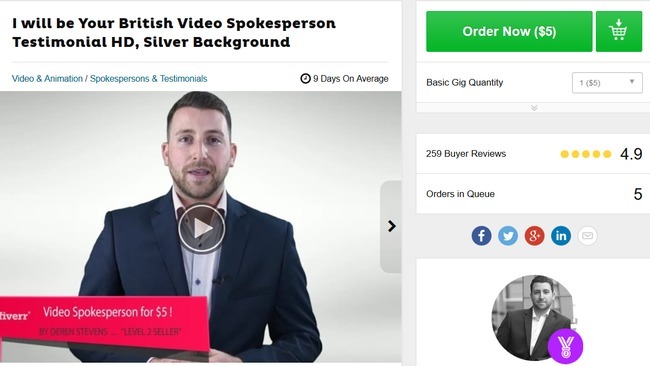 The man in the sales video portraying as the CEO is actually a Fiverr actor who gets paid to make sales videos, like the one in My First Online Payday scam. He sells video testimonials for as low as $5, and he’s a professional presenter who has appeared in several scams. These scams include Certified Income and One Step Ahead which we’ve reviewed before. 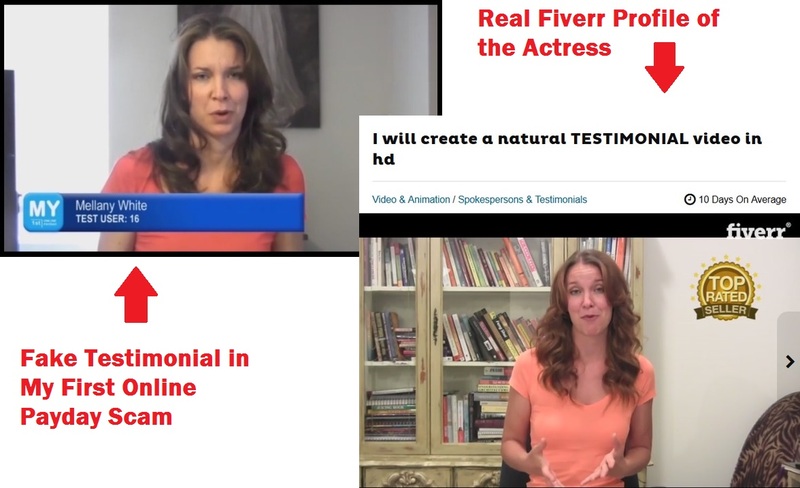 Once again, My First Online Payday scam recruit their actresses from Fiverr.com, where they can buy fake testimonials for as low as $5. 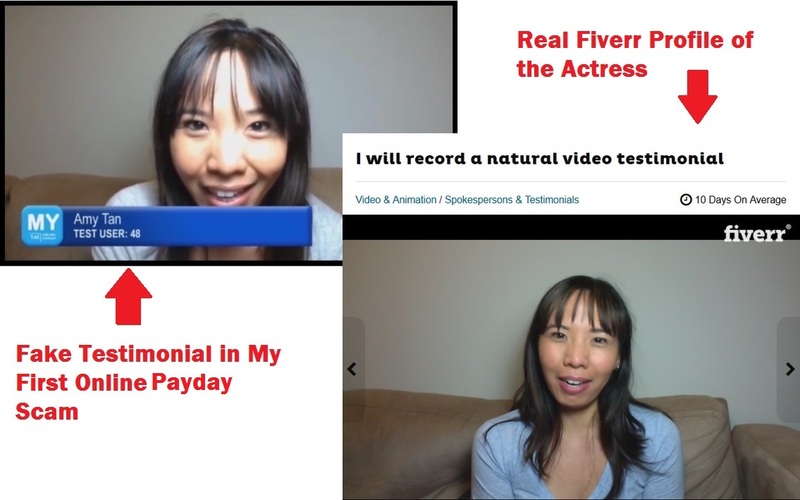 This actress was hired by the scammers behind My First Online Payday to read their script like a real testimonial, in order to create a fake illusion that their software works. The next time you come across an opportunity that is too good to be true, do some research and stay alert. It is most likely a scam. But you may ask – I played around with the software and made a few hundred dollars with it? These profits aren’t even real! You may have played 20 rounds of trades (you may not even know what you were doing) and won several hundreds of dollars. You were promised that you’ll be able to withdraw the funds once you have played 20 rounds, and no credit card information will be needed from you. However, these are just the tricks to get you hooked to the scam. Once you finish the 20 rounds, you won’t be able to withdraw your “profits”. 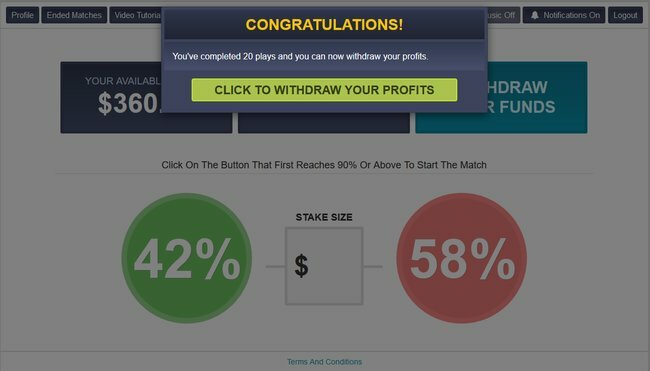 You will be asked to create a broker account, and fund at least $250 to continue playing. Scam victims who believed they’ve made money wouldn’t hesitate to fund their account in order to make more profits. And this is where they get you. The money you’ve invested will be locked with the broker, and you won’t be able to withdraw them until you’ve traded enough rounds. You will lose all your money with the software before reaching the number of minimum trades. Even though My First Online Payday keeps reassuring you that there’s no chance to lose money with their impeccable algorithm, they are denying all of it in their disclaimer. You won’t find the document in any part of their sales material, because it’s supposed to be hidden from you. You can only find a link to the document through a very small fine print at the bottom of their sales page that reads “risk disclaimer”. Due to the high risk of nature of trading, “My First Online Payday” explicitly does not make any express or implied warranties or guarantees that users will make any profit or that users will not lose any or ALL deposited investment funds. Self explanatory – Contrary to what they promise in the sales materials, My First Online Payday scam does not guarantee you any profit. Not only that, you will most likely end up losing ALL your deposited investment funds. Again, My First Online Payday scam admits that trading binary options is extremely risky, and it is only for investors who can stomach the loss of their entire investments. It’s very obvious that the scammers behind My First Online Payday scam are trying to escape from the blatant lies and fake promises they have given you in the sales materials. Is My First Online Payday a Scam? YES, MY FIRST ONLINE PAYDAY IS A SCAM. We strongly advise you to stay away from the scam if you don’t want to lose your hard-earned money.